A cooperative game for 1–5 players based on the New York Times best-selling adventures of Drizzt Do’Urden. 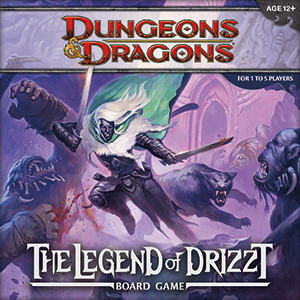 The adventures of Drizzt Do’Urden, as told in the New York Times best-selling Forgotten Realms novels by R.A. Salvatore, come to life in this thrilling board game. Take on the role of the legendary drow ranger or one of his famous adventuring companions, battle fearsome foes, and win treasure and glory. Designed for 1–5 players, this board game features multiple scenarios, challenging quests, and cooperative game play. The contents of this game can also be combined with other D&D Adventure System Cooperative Play board games, including Castle Ravenloft and Wrath of Ashardalon, to create an even more exciting experience.